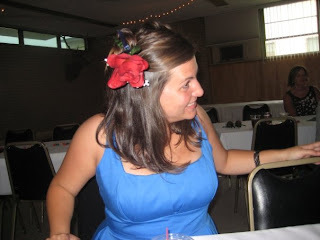 Sarah's Dog Blog: Sadie's Birthday, A Wedding and Visitors!! Sadie's Birthday, A Wedding and Visitors!! I seem to be on a monthly posting pattern - sorry about that. I really need to buy a new camera because the one I have doesn't work very well, it's bulky and I just don't really like it so I never have it with me! Fortunately my sister was in town for the last week and she had her camera and took some fun pictures!! 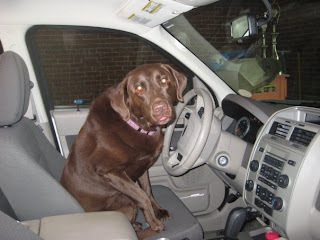 Turns out, dogs can get their learners permit to drive when they turn 8 years old. Not before that, of course because dogs have to reach a certain maturity level before they can learn to operate heavy machinery! Lucky for me, Sadie turned 8 on July 8th so now she is my driver!! She's still trying to figure out how to put the car in reverse without thumbs, so sometimes I have to take over the wheel. 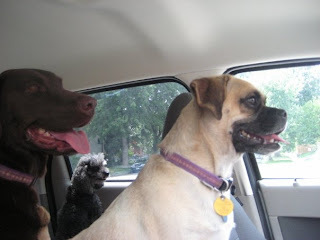 When I do, she recruits her sister (Maggie) and her cousin (Ted) to make sure I am driving properly. Speaking of an 8 year old dog, I can't believe my Sadie is getting so old! I was in Longmont and I found a dog bakery with a Pup-Pie, so I got her that as a b-day cake. 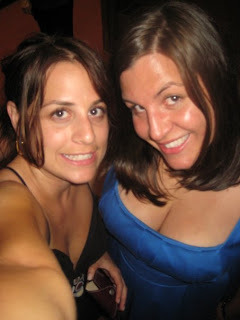 My sister came into town on July 4th and we got to spend just over a week together! It was an awesome time, and I can't believe we got along so well the entire week! She is on a biz trip to NYC right now, so I get to experience the joys of 3 dogs for the next two weeks!! Ted is so tiny, I'm afraid I might lose him, or sit on him!! Our 2nd cousin got married on the 11th in Colorado Springs and my sister and I decided to have our own little photo shoot at the reception. There are lots more pictures, but these two are my favs. Oh the hotness. We always seem to have a hard time take a good shot of the two of us, but I really like this one! Miss you sister!!! For those of you keeping track, my company is announcing layoffs on Wednesday. I find out my fate at 10am!! I'll probably post to Facebook with my status and maybe I'll even post a quick blog note. Fingers crossed for funemployment!! yay--new pictures!! you are looking good--congrats/ i'm sorry? for not being laid off--- better luck next time??? enjoy being employed and keep the cute pictures of my favorite sarah coming!